The D.Module2.6SLX45T is based on the Xilinx Spartan-6 FPGA XC6SLX45T. In the D.Module2 family it can be used to implement additional interfaces or as a data preprocessing engine if hooked between a data acquisition card and a DSP module. Up to 96 single-ended or 48 differential I/O signals are available. Programmable I/O voltages and I/O standards provide glueless system integration. Three gigabit transceivers are available to interface high-speed data converters in JESD204 standard, or as PCI/e or SATA interfaces. All D.Module2 DSP boards support a parallel bus interface to the D.Module2.6SLX45T. Depending on the DSP capabilities, alternative interfaces can be used: Link Ports, Serial Rapid IO, VLYNQ, or Fifo-based interface such as UPP or Video Ports. 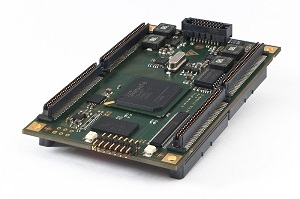 The D2.Base-FMC base board provides an interface and a test and evaluation platform for FPGA Mezzanine Cards conforming to the Vita.57 LPC FMC standard. ≫ Clocks(onboard) - Si5338 clock synthesizer, I²C programmable, generates AUXCLK and GTP reference clocks.